Posted on March 1, 2016 at 10:56 am. NetEnt’s brand new pokie Drive: Multiplier Mayhem is here and Leo Vegas want to satisfy your need for speed with a chance to win a racing package, free spins, cash and more. But there’s not long left so race in quick for the chance to win a racing experience package, depending on where you are located in the world, free spins, cash, and the latest gadgets. Up until March 3, every time you make a deposit of $10 and wager it on the new NetEnt pokie Drive: Multiplier Mayhem, you will earn a ticket into the draw to win a racing experience package. The lucky winner will be drawn on March 4. If you want free spins all you have to do is make a deposit by March 2, which you will be doing anyway if you participate in the above promotion, and wager it on Drive to win. The more you deposit and wager the more spins you will win – and the more tickets you will earn into the draw detailed above too. 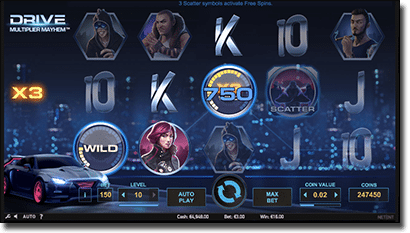 The free spins will be credited to your account the following day. You can also play the aforementioned games on your smartphone or tablet to win two points for the price of one, for example $10 on the new Drive: Multiplier Mayhem Touch version will earn you two points instead of one. As you can see there’s plenty to win at Leo Vegas online casino, so if you aren’t a member yet now is the time to become one – click our links for direct access to register an account and win big.